RAG Foods is equipped with five warehousing / distribution points across UAE. All facilities ensure product specific state of art storage facilities with temperature control system to ensure apposite storage of the goods. Special temperature controlled cold storage facilities have been installed for the storage of masalas, pulses, spices and milk powder. Constant intervention by technical experts adds on to the relentless improvement in efficiency and efficacy, resultantly impacting on the overall performance of our brands Green Farm & Victoria White. Easy Thalassery biriyani is one of the popular dishes from kerala cuisine. It can be made using mutton or chicken. 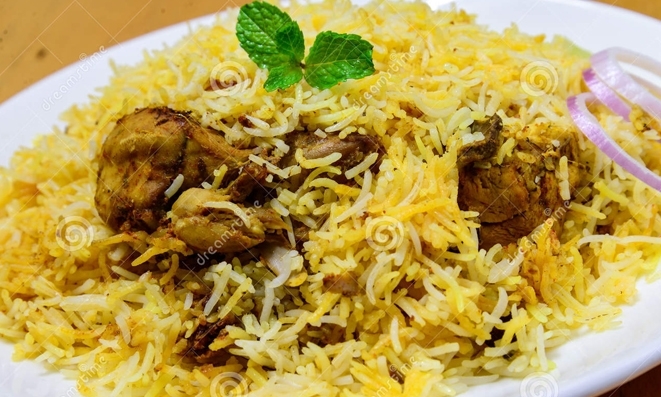 This recipe card shares ingredients & instructions to make thalassery chicken biryani. 1. Clean the spices and add them to a blender jar. I have not roasted the spices as the powder gets roasted along with the chicken. 2. Make a very fine powder. Set this aside. 3. Add 3 to 4 tbsps of ghee to a biryani pot. Fry cashews until lightly golden. Then add raisins. When they turn plump, transfer these to a plate. We will be using these for garnishing. 4. To the same pan, add onions and fry them evenly until golden or light brown. You can skip this step if you are using store bought fried onions. But the ones fried in ghee lend a delicate aroma. What you are seeing in the picture is half done. I fried them a little more. Set them aside along with cashews and raisins. We will be using these as well for garnishing. 5. In the remaining ghee, add the sliced onions for gravy. Fry them until golden. 6. Add ginger garlic and green chili paste. There is no red chili powder used in this recipe, the heat comes from green chilies alone, so make sure you use enough. I have used 2 hot chilies. Freshly ground paste is preferred. 7. Saute it until a nice smell comes out. 8. Add cleaned chicken and saute for 2 to 3 mins. The color of the chicken has to turn pale. Add turmeric and biryani masala we made at step 2. 9. Saute for 2 to 3 mins on a low flame. Cook covered for another 2 to 3 mins. By now chicken turns slightly tender. 10. Add tomatoes, salt and curd. Saute for 2 mins. Switch over to low flame and then cook covered until chicken is fully cooked and tender. In between you will need to stir to prevent burning. At the end of this step you will have thick chicken gravy. Chicken when cooked on a low heat releases moisture which is good enough to cook it completely. 11. While the chicken cooks, go ahead making biryani rice. It is made almost the same way we make MALABAR NEI CHORU. Wash the rice and drain it to a colander. As I mentioned malabar biryani is made with Jeerakasala which needs no soaking and no draining. If you are not having that rice, then use basmati rice. Wash and soak for 30 mins. Drain and set aside. Bring water to a boil on another burner. 12. Heat a pot with 1 to 2 tbsps ghee and saute the spices. 13. Add drained rice and saute for 2 to 3 mins. Add salt. 14. Add hot water. Note that cold water makes the rice sticky. Stir gently. 15. Cook on a medium heat until the entire water is absorbed but still very wet. 16. Cook covered and lower the flame completely and cook until the rice absorbs all the water and turns dry. At this stage rice is cooked to 90% meaning al dente. If the rice is under cooked, you can sprinkle some warm water and continue to cook. 17. By then the chicken would have completely cooked. A thick gravy would be left. Add mint and coriander leaves. Level the chicken properly. 18. Layer half of the rice and sprinkle garam masala, some fried onions and pudina. 19. Layer the rice again. 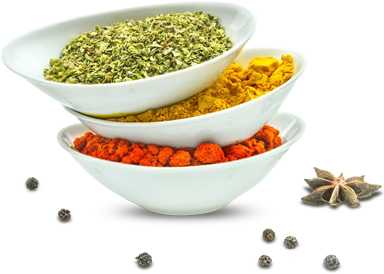 Sprinkle coriander leaves, pudina, fried onions, cashews and raisins. Add ghee mixed with rose water. 20. Cover with a very tight and heavy lid. or seal it with a foil or thick moist cloth. Place a steel plate over the seal and then an heavy object. Heat a old tawa or griddle. When it turns very hot, place this biryani pot over the tawa and cook for 12 to 15 mins. Make sure the flame is medium. Allow biriyani to rest for a while and check the bottom, the moisture in the gravy or masala would have evaporated. Serve malabar biryani with onion raita. When you serve make sure each portion gets an equal amount of the masala and the biryani rice. 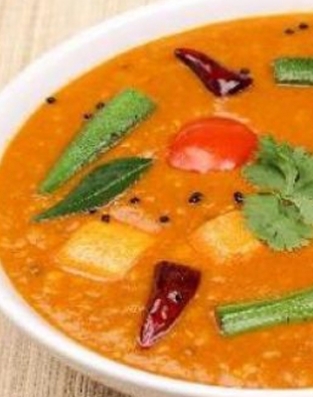 Wash the dal and cook along with the tomatoes, turmeric, chilli powder, coriander powder, cumin powder and 3 cups of water in a pressure cooker. 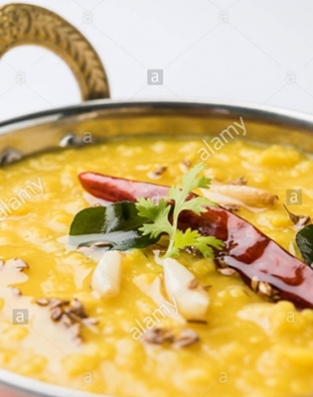 When the dal is cooked, mash well, add the salt, and a little more water, if required. In another vessel heat oil and the smashed garlic, mustard, red chillies and curry leaves. When the mustard splutters pour in the cooked dal and mix well.